So Spider-Man PS4 is nearly here, and Sony is also present to remind us that it's kind of a big deal. 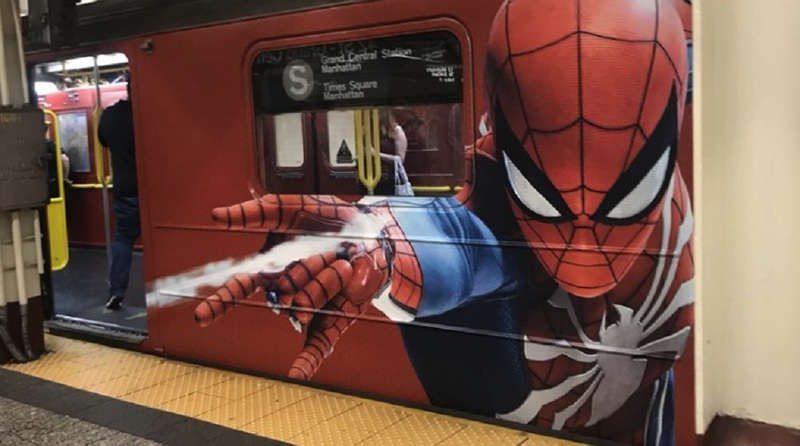 In addition to some rapid-fire gameplay and plenty of E3 demo impressions, they've also remodeled a train in New York City. Several Twitter users are noticing the Times Square shuttle, which is pretty difficult to miss -- emblazoned with Spider-Man's classic red coloring. It also sports Daily Bugle newspaper props and various J. Jonah Jameson paraphernalia. I dig the color scheme! Spider-Man (which I wish had a subtitle of some kind, so in 10 years from now when I'm talking about "Spider-Man" people don't think I'm refering to the Sam Raimi film or something else) is out on September 7 on PS4.